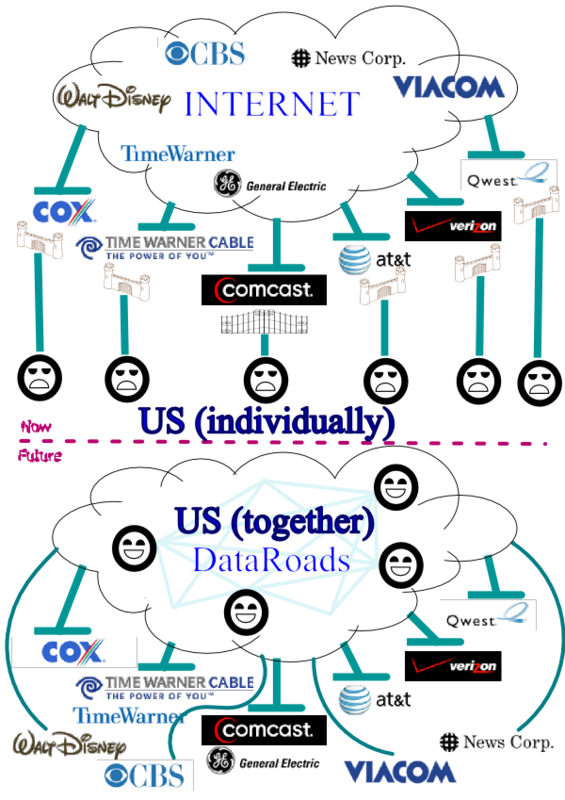 This may not be the prettiest possible illustration of the Internet hierarchy flip intended by the Data Roads Foundation, but hopefully it is at least clear. All of the company logos were taken from the FreePress.net Media Ownership pages. The Big 6 content companies are floating inside the Internet cloud on top, but they fall to the bottom once DataRoads.Org infrastructure is in place, vying to connect to the new cloud owners (us!). The top 6 Internet access controllers hover in the middle, currently standing as a gateway between all of us and the wider Internet. After DataRoads.Org connections between us are finally complete, these same networks lay with the content companies in the bottom, all vying for better connections into our cloud. At this point, if these descending titans failed to connect into our DataRoads cloud(s), they wouldn’t have a prayer of keeping their business customers interested in their networks. You can see the content corporations finding ways to get around these failed gatekeepers, to connect to all of us (their customers) more directly. If you find my illustration ugly at all, take that as a personal challenge: draw one better! The illustration and all its constituent pieces should be considered public domain. The castle gates and iron gate illustrations were found at a site for public domain clip art, Clkr.com. Other than the company logos from FreePress.net, I drew everything else myself, and you are free to use it all. You can even use the original Inkscape SVG, or the compressed plain SVG format. You can also use the PDF I exported, which might be easiest if you want to print it out and hand-draw anything on it. Maybe we will hold a contest for the best “Internet flip” illustration! Use the comments here to enter, or to apply to be a judge. Remember to give us your valid email address in your comment profile — it wont be shared with anyone else, and your entry will be invalid without it. All entrants must assign full rights to the Data Roads Foundation and its current officers to use or re-license the illustration however we please (preferably CC-BY). The winner will earn a permanent place in the illustration credits, and in our hearts. Next Next post: Power over DataRoads: Energy competition through microgrids.